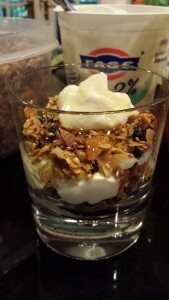 Homemade Granola. In keeping with my “eating healthier” trend, I finally decided to start to make my own homemade granola. 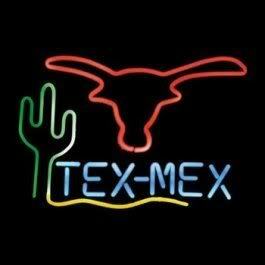 I really don’t know why I never tried to make it myself. For years I’ve loved Michele’s Granola which is locally sourced in my area in Baltimore, Maryland, and makes some of the tastiest granolas ever. And Whole Foods Market carries a number of 365 brand granolas as well as some bulk and pre-made options. And Trader Joe’s carries a selection of premade granolas — my favorite for many years has always been maple pecan. So I was thinking that it is so easy just to purchase a good quality granola rather than make it. But boy, was I wrong about that! The Cherry and Coconut Granola recipe on Epicurious.com uses rolled oats, chopped almonds, unsweetened flaked coconut, sesame seeds and chopped dried cherries as its dry ingredients. To that, it adds melted coconut oil, honey, maple syrup, vanilla extract, cinnamon and salt to make a sort of syrup of wet ingredients. Mix it all together, place on a parchment paper-lined baking sheet, and bake and stir until golden brown. 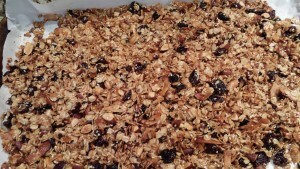 When baked, remove from the oven and let the granola cool. Store in an airtight container. No matter how I felt about the final product, my husband loved it. 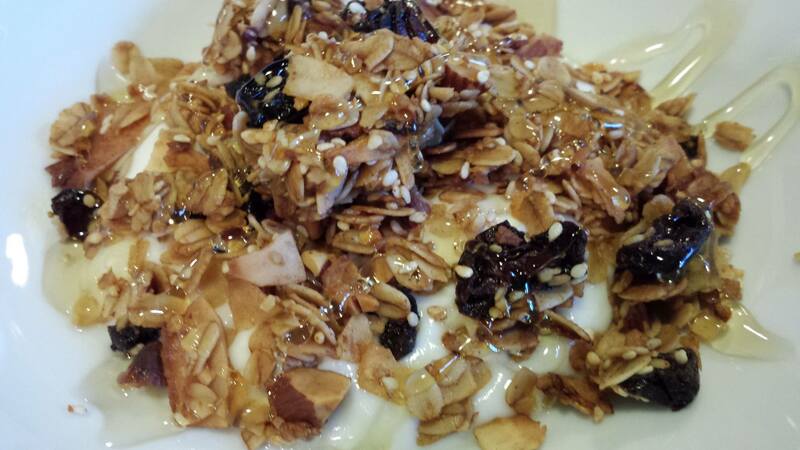 The granola disappeared pretty quickly, served along with Mesquite honey and organic plain yogurt for his breakfasts. Since that first batch of granola, I’ve tried a few different ingredient pairings, more or less sweetener and oil, and a bit of tweaking to the baking process. I love to take a recipe and then make my own modifications based on the way that I cook and on my personal preferences for ingredients. 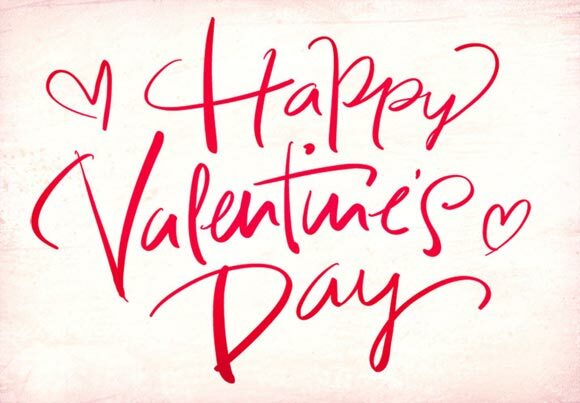 And you should, too. First of all, decide what ingredient combinations that you like. The second time that I made the Epicurious recipe, I added finely chopped dried apricots and shelled pistachios. That was a big hit. Stirring in some cacao nibs or mini morsels add a chocolatey flavor to the granola. Additionally, I cut back slightly on the amount of coconut oil in the recipe. And I lowered the temperature of my oven for the baking process since my oven runs hotter than most ovens. I added 2 tablespoons of brown sugar which seems to help the granola pack into chunks nicely after it’s baked. Also, when the granola had finished baking, I then stirred in the dried fruits before it cooled. It seemed that the dried fruits got too chewy and caramelized during the baking process. Once the granola has its dried fruits stirred in, and it’s ready to begin to cool, take a spatula and sort of pack it together to form a firm “patty” of granola. 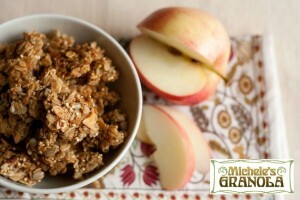 This will give you some chunks after the granola cools and you can break it up to store or eat it. 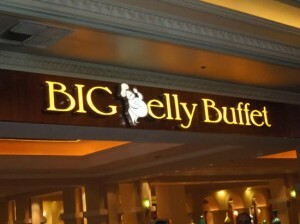 Skip the patting down step if you like to sprinkle your granola and don’t like chunks. This granola will remain fresh and crunchy in an air-tight container for up to a week, if it lasts that long. It won’t last that long in my house. 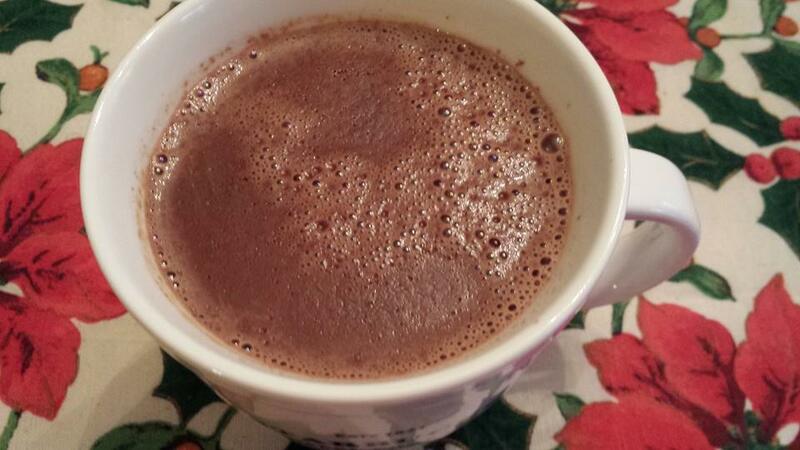 Other mix-ins such as spices, cacao nibs, carob or chocolate chips, etc. 3. Combine the rolled oats, nuts, flaked coconut, and sesame seeds in a large bowl. 4. In a smaller bowl, combine the melted coconut oil, honey, maple syrup, vanilla extract, brown sugar, cinnamon, nutmeg, and salt. Stir until combined well. 5. Pour the wet ingredients over the dry ingredients and mix well. 6. 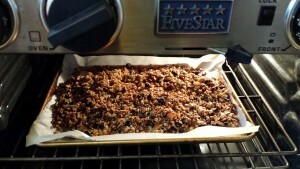 Spread the granola mixture over the parchment paper lined baking sheet. 7. Bake the granola, stirring often, until it has turned a golden brown, about 20 – 25 minutes. Be careful not to burn or over toast the granola. 8. When the granola is baked, remove the baking sheet from the oven. 9. 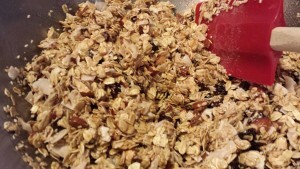 Stir the dried fruits into the baked granola, combining well. 10. Pat the granola into a firmer packed bar-style if you want chunks and then let it cool. Otherwise just let the granola cool. 11. When the granola has cooled, you can either serve it immediately, or store it up to 2 weeks in an airtight container, if it lasts…..
Makes about 6 cups of granola. Serve with yogurt and honey for drizzling. Sprinkle over ice cream, layer with yogurt in a parfait, or just eat by hand. Variations: You can vary the nuts, dried fruits, and other mix-ins. 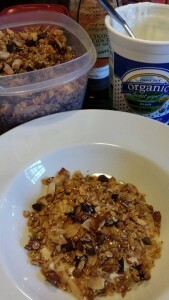 You can use another oil instead of coconut oil, yet I like the flavor that the coconut oil adds to the granola. If you have nut allergies, omit the nuts.